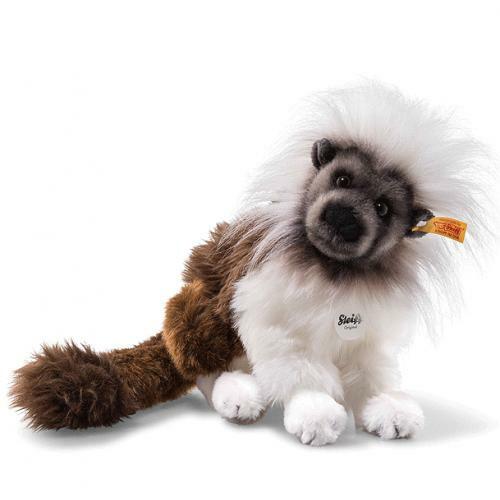 Protect Me Tami Monkey is hand made in the finest brown, white and grey cuddly soft plush and carries the famous Steiff trademark, Button in Ear with the Yellow tag. A cute fellow is the 23 cm Protect Me Tami monkey. Its living model comes from the family of marmosets and is extremely endangered by the destruction of its habitat in the form of deforestation of the rainforest. Because of its cute appearance, this monkey is also caught and kept as a pet. It is on the red list of endangered species and is threatened with extinction. But here it is made of cuddly soft plush. The face is gray and the head is surrounded by long white plush. The airbrush technique in brown highlights the claws, the ear edge, the mouth and the face mask pretty. The belly is white and goes into the brown rump with the long, bushy tail. The bar winders in the front legs ensure a good grip while sitting. With this cute, lovingly designed comrade, your child is reminded of the beautiful wildlife and it has an exotic-looking playmate.